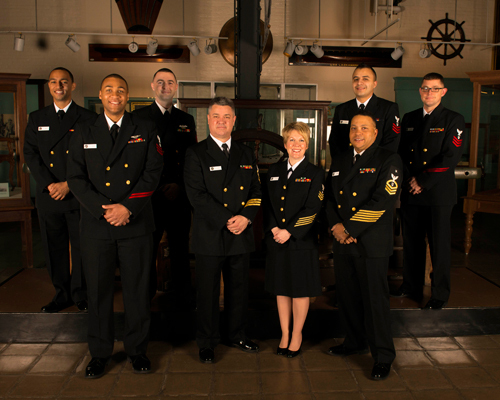 As the U.S. Navy’s premier contemporary music ensemble, the Cruisers feature seven of the Navy’s most dynamic performers. Under the direction of vocalist, Chief Musician John L. Fisher, the “Cruisers” contemporary music ensemble is the newest specialty unit of the United States Navy Band in Washington, D.C. The group takes its name from the Navy’s versatile, flexible, multi-missioned ship – the Cruiser, and is ready to live up to its namesake by performing a variety of music ranging from classic rock to rhythm and blues as well as today’s top 40 hits. In constant demand for dances and parties, the group traveled to Oslo, Norway, in September 2004 for the Norwegian Military Tattoo. In addition, they performed in Keflavik, Iceland, in October 1999 for the Naval Air Station’s Navy Birthday Ball. Smaller combinations of the group often perform at the Chief of Naval Operations’ quarters for official receptions.